'Never Let Me Go' is an emotional, heart-breaking novel. I went into it not knowing what to expect, but knowing that it was a powerful story. Not much is given away in the book synopsis. Kathy is thirty-one and now looking back on her life with some nostalgia and wondering how things could have been. She was just one of many special students at the boarding school of Hailsham, where the students are told often that they are special and must look after themselves physically. They are encouraged to produce artwork of any kind, and to foster strong friendships. Kathy's best friends, Ruth and Tommy, help her to reflect on the life of being special people in a dark version of our world. It is hinted at from the very beginning that the students at Hailsham had a fate awaiting them once they left the confines of the school at age eighteen. Not even the children are particularly lucid when contemplating this, as they have never been encouraged to think on it. I really don't want to go into it much further as I don't want to give away the core discovery. I enjoyed the way this book was written. 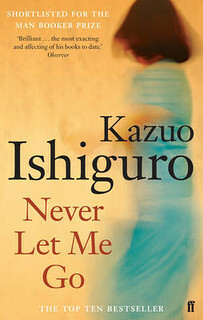 It was not easy subject matter to digest, but Kazuo Ishiguro writes with elegance and a simplicity which shows us the bare humanity of his characters. He really shows us the vulnerability and fragility of the characters and the lives they lead. The novel explores, in-depth, the relationships we cultivate in our early lives and as young adults, and examines how well we succeed in holding onto that familiarity when everything starts to change. I did find Kathy to be a fine narrator. Sometimes her narration was sparse and she decided not to reveal everything at once. She focused more on individual experiences or moments in her life that counted towards where she was in the present. She cannot help but imbue her sentences with a tinge of loss and sadness, but we already know when we start the novel that things are not as they once were, for Kathy. A very interesting and well-written protagonist, in my opinion. I really hesitated over giving this novel three stars, and did think about giving it four. However, I realised that I didn't -really- like it as a whole. I only liked it. I think it was a really interesting exploration of an idea, but as a whole the novel did not feel cohesive or exactly finished. Looking back on one's life, picking out anecdotal episodes to illustrate a point, did not make me feel like I had experienced everything and really understood everything. This unsettled feeling made me lean more towards three stars. I do recommend reading this book, as I certainly did not dislike it. It is a sensitive handling of a difficult topic, and definitely food for thought if that reality was ours today. 'Never Let Me Go' is a subtle novel and should not be underestimated. Definitely give it a try.